The words are strong, the language is forceful, the sentiments are probably excessive, but the meaning is clear. "(They) have really sabotaged education for political gain," Ron Green, who served as the education minister during the United Workers Party (UWP)'s four-and-a-half year reign, has said of the Dominica Labour Party (DLP) administration. In his assessment of the state of education here, Green saw the much touted universal secondary education programme as an example of everything that's wrong with the government's approach to education. The UWP, which called itself the "Education Party", introduced universal secondary education on a trial basis at what is now the Pierre Charles Secondary School in Grand Bay. This was part of an agreement with the then UK Overseas Development Administration (ODA, now the Department for International Development, DFID) to construct a new secondary school in the community. At the time, about 30 per cent of primary school students made it to secondary school, less than a quarter of secondary teachers were graduates and only 11 per cent were professionally trained. The UWP made several promises related to the development of education in its manifesto for the 1995 general election, including free text books and increased transition rates to secondary schools. The Grand Bay experiment was supposed to help guide the policymakers regarding the expansion of universal education. A report produced in 2001 recommended "gradual expansion" of the programme, according to the former education official, Arundel Thomas. However, in 2005the Roosevelt Skerrit administration decided to introduce the programme island wide. "It was introduced to all secondary schools without taking into consideration the report on the lessons from Grand Bay," Thomas told The Sun. "They went ahead with universal secondary education without learning from the Grand Bay experience," added Green. "I think they rushed ahead with (it) for political reasons." The decision has reaped rewards, the government information service (GIS) quoted the current education minister, Petter St. Jean, as saying in April last year. He did not say what these rewards were, but a year earlier, the then chief education officer, Steve Hyacinth, had staged a stout defence of the decision. "This country could not continue with what used to be the common entrance examination, where 30 students out of a cohort would enter in secondary school. Within the world order today, we had to ensure that every child had that opportunity at his disposal. Universal secondary education is the way forward to ensure that every child has that opportunity to move on," he said then. The programme has its share of challenges and glaring fatal flaws, critics contend. They argue that it dumps large numbers of illiterate students who fail primary school on the secondary school system, forcing teachers to try to balance the special needs of these children with the needs of those who are capable of handling secondary school work. "We are having (hundreds) of students coming out of primary schools (and into the secondary schools) without being able to read," lamented Green. Universal secondary education is just one of many issues that concern Arundel Thomas, a former assistant chief education officer and the holder of a master's degree in education. The number of male underachievers, an inadequate pool of trained teachers and the high percentage of students who fail to graduate are among the issues that must be addressed, he told The Sun. "Something has to be done to answer these questions. For you to say a school is a success, at least 80 per cent of students who enter first form should graduate after fifth form." These and myriad other problems plaguing education are the result of a lack of leadership, Green contended. While stressing that he had "a lot of respect" for teachers, administrators and technical staff, the former minister had no difficulty pointing fingers at those charged with charting the course for development. 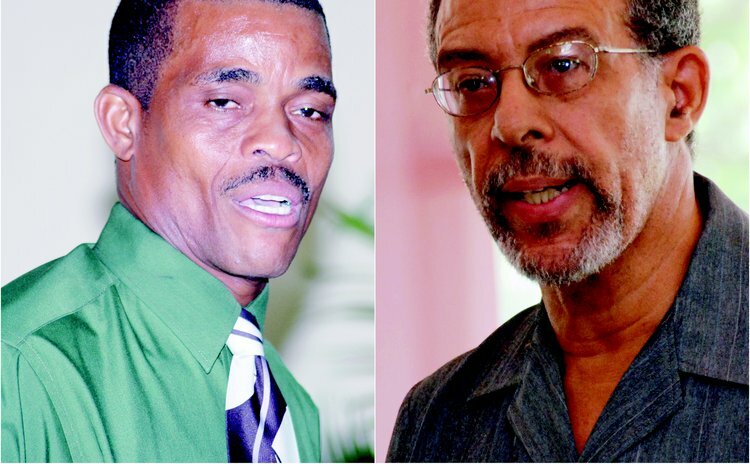 "The leadership in education, from (Roosevelt) Skerrit to Vince (Henderson) to Petter (St. Jean) has been very poor," Green said of the men who have served as ministers of education in various DLP administrations since 2000. He told The Sun that after the UWP came to power in 1995, the party introduced a series of reforms, which included the building of new schools, the provision of opportunities for 17 teachers to receive training at the master's level and the introduction of learning support units. The introduction of universal secondary education in Grand Bay was also part of these reforms. "We went from 33 per cent of students going from primary to secondary school, to 66 per cent," Green boasted. "My sense is this reform has been sacrificed on the altar of politics."